Since the Food and Drug Administration (FDA) approved the Pipeline® Embolization Device (PED) for flow diversion in large or giant wide-necked aneurysms in 2011 after the multicenter Pipeline for Uncoilable or Failed Aneurysms (PUFs) trial proved its safety and efficacy1, the revolutionary device continues to improve treatment of the most complex aneurysms. The latest version, the Pipeline™ Flex, features a vastly improved delivery system. According to Kevin Cockroft, M.D., M.Sc., co-director, Penn State Comprehensive Stroke Center, “We now have the ability to reposition the device, which allows for more precise placement instead of always needing to hit the exact target on the first attempt, and this appears to have shortened the learning curve for clinicians.” Hershey Medical Center was one of the first in the country to offer treatment with the PED, and has performed close to 70 of the procedures to date. 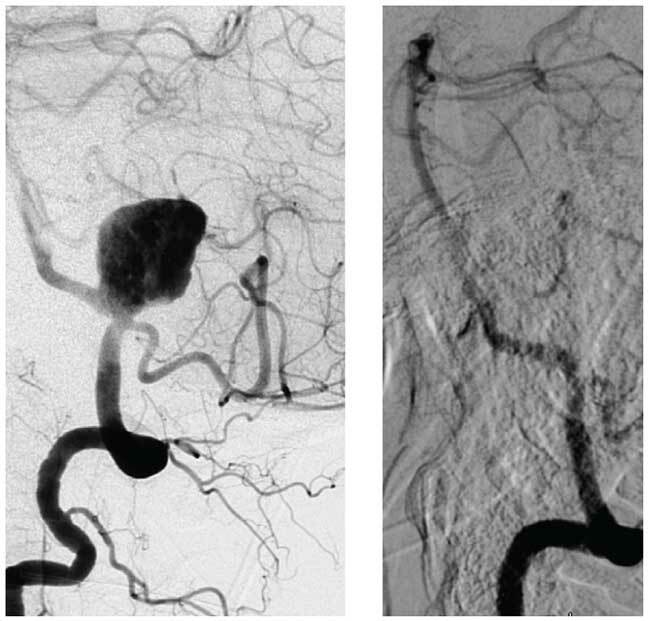 Digital subtraction angiogram in lateral view before and six months after treatment.